SALT LAKE CITY — Most Utahns know the state is growing, but few realize by how much. New research from Envision Utah shows that growth is sparking fear over food security. It’s easy for consumers to find what they want at the grocery store. But few of the fruits and vegetables in the produce section are grown in Utah. That’s just one finding of the research. Utah adds about 70,000 new homes — nearly equivalent to the city of Ogden — every year. At that rate, Utah will reach 4 million residents in 15 years, the research shows. “This was a quiet street when I was growing up,” said resident Luke Petersen, who is a farmer. He sees development moving in on his family farm and a Sprouts grocery store going in next door. The areas with the highest growth are the only places that grow fruits and vegetables. “Fruits and vegetables are going to become much more difficult to grow, maybe impossible,” he said. 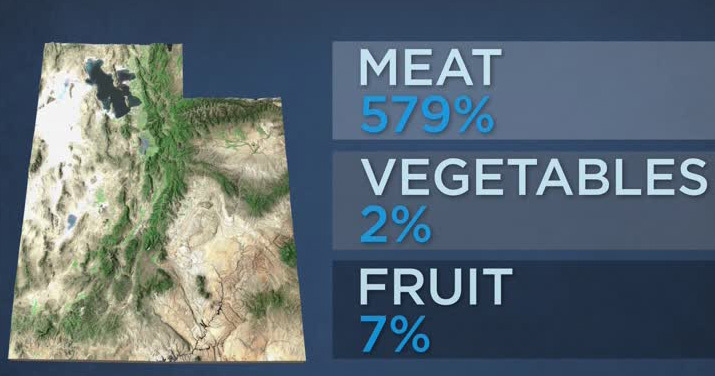 Right now, Utah produces 579 percent of the state’s meat needs, 2 percent of its vegetables and 7 percent of its fruit. For the latter, Utah relies on California, a state facing its worst drought in a century. “They view it as critical for the future and they really want to see that they can be safe and secure and have food for their children and grandchildren,” Grow said. Envision hopes more Utahns will get involved in setting state priorities. After all, contrary to what 75 percent of Utahns think, growth isn’t coming from Californians. Seventy percent of Utah’s growth comes from Utah. To get engaged with Utah’s growth, go to envisionutah.org. It includes tools to register how you think the state should move forward.